Last week I was invited to a screening of the documentary “For the Benefit of All Beings: The Extraordinary Life of His Eminence Garchen Triptrul Rinpoche“. A quote from the promotional materials – “watching this film is the closest experience of Jesus Christ that I have ever had in my life.” – was intriguing enough to ensure my attendance. I had nominal awareness of Garchen Rinpoche and certain no understanding of this man’s life experience. Before I saw the film, I Google the film title to get a better understanding of what I was about to experience. The documentary tells the story of a Tibetan lama who was recognized as a great reincarnation and enthroned at the age of seven. He went through extensive monastic training and was half-way through a traditional three-year retreat when the Communist Chinese Army invaded Tibet. Garchen Rinpoche took up arms against the Chinese, allowing the Dalai Lama to escape. He was subsequently imprisoned and tortured for 20 years during the prime of his life, age 22-42. Its like a Hollywood script, isn’t it? What I learned from watching the film was far more profound and moving. In prison, Rinpoche met his root lama and practiced the Buddhist teachings in secret. Upon his release, he emerged a Realized Being – achieved through mindfulness meditation when the self is seen to be nonexistent, the human being is freed from narcissistic concerns — the source of suffering. 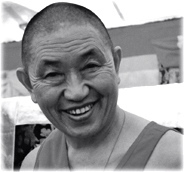 In the following years, Garchen Rinpoche risked his life to help re-establish the Dharma in Tibet. Now, he teaches the path of transformation he relied upon in prison to audiences around the world. Even if buddhism is not your religion or a narrative of interest, you cannot help but be awed by Garchen Rinpoche’s story in the face of unthinkable adversity. He is the powerful embodiment of what can happen for any human being who unequivocally commits themselves to living For the Benefit of All Beings. And this film, directed, produced, filmed and edited by Christina Lundberg, is beyond a documentary. It is a love letter to Garchen Rinpoche’s followers, ensuring they and others understand how much benefit his legacy and blessings will bring to the world, long after he has passed away. The theme song is White Tara Blessings, sung by Mercedes Bahleda. The screening was sponsored by Victoria and Michael Imperioli.